H.E. Ambassador Ivan Mrkic visits "Yonden Shikoku Electric Power Co., Ltd."
At the invitation of the management of "Yonden Shikoku Electric Power Co., Ltd.", H.E. 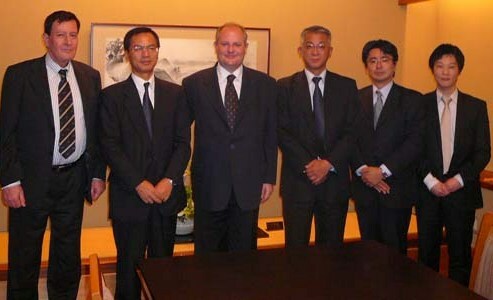 Ambassador Ivan Mrkic visited the company headquarters in Takamatsu on Shikoku island on June 18-19. The hosts conveyed "Yonden's" interest to take part in various projects in the energy sector of Serbia, either through joint investments or as contractors for the projects financed through foreign loans, which would ensure stable electric energy supply and protection of the environment. This especially applies to the planned construction of thermal electric power plants, mini hydro-electric power plants and wind farms. Since most electricity generating plants in Serbia are coal fired, clean development mechanism projects for reducing greenhouse gas emissions will also be implemented by the Serbian Government. "Yonden" is planning to discuss prospective projects with the Electric Power Industry of Serbia (EPS). As part of annual consultations on consular issues, Ambassador Mrkić and Deputy for Consular Affairs Ms. Kovač paid a visit to Honorary Consul General, Mr. Naohide Ueyama, in the premises situated in “Dainihon Jochugiku” Company (better known as Kincho) in Osaka. They also had the opportunity to visit the oldest factory of “Kincho” Company in Arida (Wakayama Prefecture), the birth place of Mr. Ueyama’s ancestor, Eiichiro Ueyama, the first Honorary Consul of Kingdom of Yugoslavia (more details, please click here). In Kyoto, Ambassador Mrkić presented the “Embassy’s Aknowledgements” to Prof. Dr Shin-ichi Kanemaru, from Graduate School of Medicine, Kyoto University, for his expertise and succesful treatment of Serbian patient. On June 18, during their visit to our Embassy, “Tokai Shiritsu Yokosuka Junior High School” students and theacher Mr. Kojima, had the opportunity to hear more about our country and enjoy video footage of Serbian beauties. On June 8, “Aihara Junior High School“ students from Kanagawa Prefecture visited our Embassy and met with Ambassador I. Mrkić and Ms. A. Kovač, who informed them more about Serbian traditions, architecture and national sports. On June 3, Rector Kovacevic paid a call on Madame Shinrei Ito, Chief Executive Adviser, the trustees and officials of the ITO Foundation. He was accompanied by the Counsellor of the Embassy Mr. Nebojsa Tasic. This visit was an opportunity to continue talks on furthering mutual cooperation, which were started in December 2006 when a delegation of the ITO Foundation visited the Belgrade University. Rector Kovacevic, who was given an exceptionally warm welcome, thanked Madame Shinrei Ito on the scholarships and on the donation of a powerful computer to the Belgrade University for research purposes. 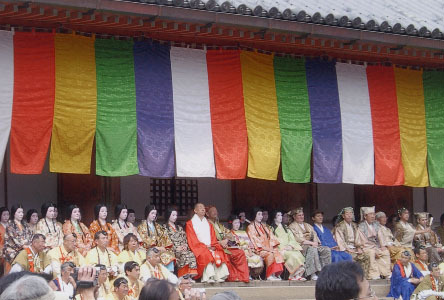 Since 2005 seven scholarships were provided by ITO Foundation for studies in Japan. Madame Ito expressed great satisfaction with the results achieved by Serbian students during their studies at Japanese universities, saying that Serbia has a great potential in a highly educated and very talented young generation. She also said that it was a pleasure to cooperate with the Belgrade University which has a long tradition as the largest and oldest university in South East Europe and the Western Balkans. 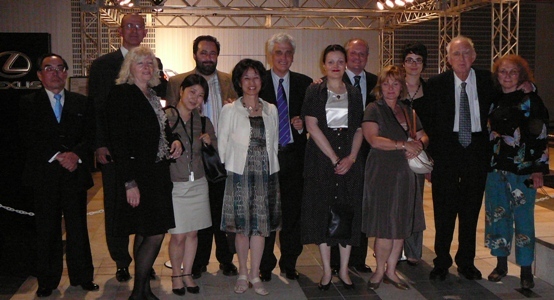 Rector Kovacevic invited Madame Ito and her associates to attend the official celebration of the 170-th anniversary of the Belgrade University in July 2008.
International Conference on Advances in the Internet, Processing, Systems and Interdisciplinary Research – IPSI 2007, jointly organized by the Serbian and Japanese scientists, was opened on May 31 in Tokyo. In the three-day conference, held for the first time in Asia, scientific elite from all over the world took place. Among the participants were Prof. Martin Perl, Nobel Laureate from the Stanford University, Prof. Linda Naimi from the Perdue University, ex Vice President for Information Technologies from Harvard, Prof. Hironori Fujii from the Tokyo Metropolitan Institute of Technology, Prof. Hirosato Nomura from the Kyushu Institute of Technology, Prof. Hirotoshi Kubota from the Teikyo University and many others. On behalf of the organizers, Prof. Fujii addressed the gathering. Rector of the Belgrade University, Prof. Dr. Branko Kovačević, Serbian Ambassador to Japan Mr. Ivan Mrkić, Prof. Perl and other guests also gave speeches, praising the initiative of the Serbian scientists and scientific quality of the IPSI Conference. Rector Kovacevic said that the University of Belgrade would soon be celebrating 170 years of its existance and that it would continue to cooperate closely with the major scientific centers in Japan and the world. Ambassador Mrkic reminded of some of the greatest names of the Serbian science, like Nikola Tesla, Mihajlo Pupin, Milutin Milankovic and others. He said that, judging by its scientific potential and the pace of its development, Serbia could soon become one of the important information technology centers in the Central and Eastern Europe. The International IPSI conference is an example of successful cooperation between Serbian and Japanese scientists, as well as yet another proof of the contribution of the Serbian science to the world scientific trends. Rector of the Belgrade University, Prof. Dr. Branko Kovacevic, who is currently visiting Japan, was received by the President of the Nippon Foundation, Mr. Yohei Sasakawa, and the Executive Director of the Tokyo Foundation, Ms. Elen Mashiko. Rector Kovacevic expressed his gratitude for long standing and fruitful cooperation between the two Foundations and the University of Belgrade. 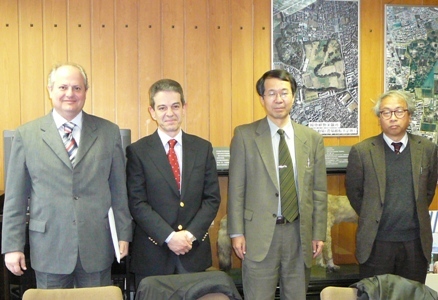 Representatives of the Nippon and Tokyo fondations expressed their readiness to continue to cooperate with Belgrade University, providing scholarships for the best students of the University, inviting Serbian scientists and researchers to participate in the international projects funded by these foundations and to enhance cooperation in all other educational and scientific fields. The president of the Association of Medical Workers of Serbia Dr Radmila Nesic and Dr Milunka Lazarevic attended the international conference Nursing at the Forefront and the International Council of Nurses (ICN) Conference at the National Convention Hall, Pacifico Convention Center in Yokohama, May 26-June 1, 2007. Serbia became member of ICN in 2005 and was elected this year to its executive body-the Council of National Representatives. H.E. Ambassador Ivan Mrkic and Counsellor Mrs. Snezana Jankovic were invited as guests to the Economic Seminar, organized by the Liberal Democratic Party to support the candidature of Mr. Kenzo Yoneda for the Upper House Election. Mr. Shoichi Nakagawa, Chairman of the Policy Research Council of the LDP gave a lecture, while many distinguished guests attended the gathering, among them Mr. Bunmei Ibuki, Minister of Education, Culture, Sports, Science and Technology, as well as other representatives of the Japanese Parliament, Government and academic circles. 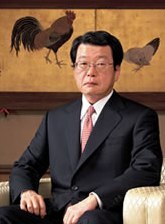 Mr. Yoneda is an old friend of our country, who currently assumes the position of the President of the Board of the Japan - Serbia Exchange Association. 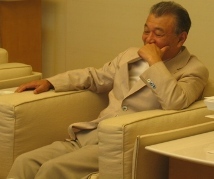 During his previous term as a member of the House of Representatives, Mr. Yoneda was one of the founders of the Parliamentarian League of Friendship between Japan and our country. On May 20, "Action for Children in Crisis" (ACC) held a charity fair presenting ethnic clothes and goods from Serbia. This NGO has been very active with humanitarian work in Serbia, especially in Kosovo province, where they visited Serbian enclaves and held several creative workshops for children ("Grandmother’s hand", "Boat in the wind"). They also cooperated with NGO „Hi Neighbour“ from Belgrade, which facilitated organizing several other workshops with orphans and refugees. On May 17, students of "Awaji Shiritsu Higashiura Junior High School" from Hyogo Prefecture visited the Embassy, where they met with Ambassador Mrkić and Ms. Kovač in charge of Culture Affairs. In lively conversation on various topics, students had the opportunity to hear more about Serbian music, sports and cuisine. 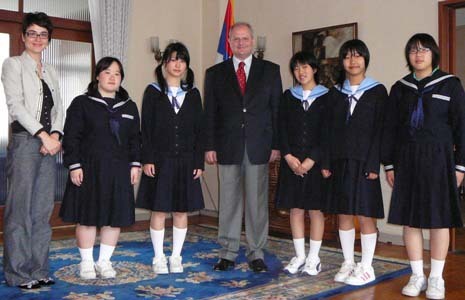 On May 16, Ambassador Mrkić welcomed students of "Yagiyama Junior High School" from Miyagi Prefecture, who were eager to know more about overall situation in Serbia. They were introduced current political issues, as well as history and cultural heritage of our country. 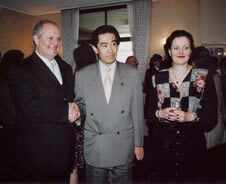 On May 25th 2007, Japan International Cooperation Agency (JICA) will hold a seminar in Belgrade on the rehabilitation of the mining industry in the Republic of Serbia. The seminar is supported by the Serbian Government and the Embassy of Japan in Belgrade. JICA team in Serbia is currently working on the Master Plan for the Promotion of the Mining Industry in the Republic of Serbia. This is one of the biggest projects funded by JICA which was started in August 2006 and will be finalized by the end of December 2007. Ms. Aleksandra Kovač, Deputy for Cultural and Press Section, participated on May 12, at the 10th „Japanese Speech Contest“, organized by Foreign Embassies Friendship Association, with support of MOFA of Japan, Ministry of Education and Culture Agency of Japan. 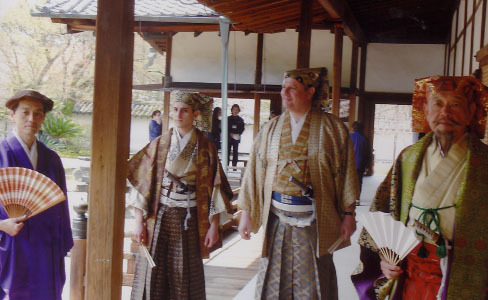 She has been awarded with a special prize of the jury for her speech “My Meeting with Kyudo“. 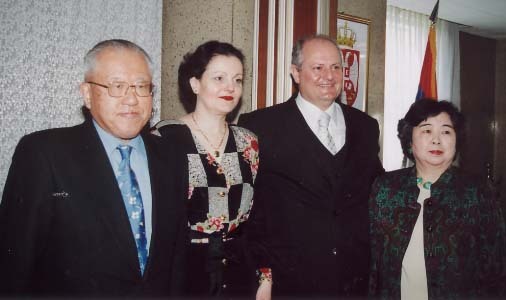 In the previous years, Mrs. Snežana Janković, then in charge of Cultural Affairs, won the first prize (Award of MOFA of Japan) and Ms. Tijana Zdravković, then Ambassador’s Secretary, won the second place (Award of Ministry of Education). On May 10, Ambassador Mrkić with his wife and Ms Kovač, Head of Cultural Section, visited Printing Museum in Tokyo where they were warmly welcomed by Koichi Kabayama, director, Izumi Munemura, Head of Curation and Planning, providing a guide tour through museum’s premises and exhibition halls. The visit was organized by Hisashi Ueyama, representative of Honorary Consulate General of Serbia and senior managing director of Kincho Company, whose posters are part of ongoing exhibition in Museum. On the invitation of Prof. Dr. Nobuhiro Shiba from Komaba Campus of Tokyo University and Secretary General of Japan-Serbia Friendship Association, in the beginning of May Prof. Ristović, from Faculty of Philosophy at University of Belgrade, made an official visit to Tokyo University where he held lectures for postgraduates in the area of historical sciences. 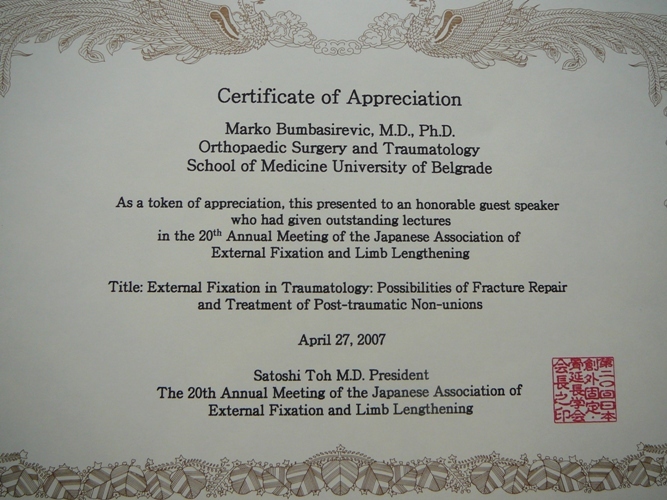 On April 27th, Prof. Bumbaširević, Head of Traumatology Clinic to the Clinical Center of Serbia, participated at the 20th Annual Meeting of the Japanese Association of External Fixation and Lim Lenghtening. For his outstanding lecture as a guest speaker, Prof. Bumbaširević was awarded with Certificate of Appreciation by Dr. Satoshi Toh, President of the Association. Full time professor at the Faculty of Veterinary Medicine, Belgrade University, Prof. Jugoslav Vasić, visited Tokyo University in April where he met with Prof. Dr. Shinichi Shogenji, Dean of Graduate School of Agricultural and Life Sciences at The Faculty of Agriculture and Prof. Dr. Susumu Kumagai from Research Center for Food Safety. The talks included the possibilities for establishing a cooperation between two universities and its related faculties. Prof. Dr. Shigeru Saito of Shounan Hospital, who visited the Embassy on March 16, made fourth visit to the Clinic Center of Serbia in Belgrade where he has treated five patients, demonstrating new surgical technics in the field of cardiology. Dr. Saito, who made 10.000 interventions of this kind by now, made his appearance together with Dr. Antonio Colombo, world-renowned interventional cardiologist. A factory in northern Serbian town of Senta has started production of Japan Tobacco International brands such as Winston, Camel and Monte Carlo. 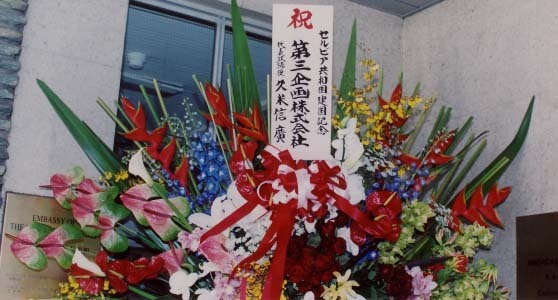 The opening ceremony for the new Japanese plant was held on April 25, 2007. JTI is the first company from Japan to invest in Serbia. The company has long term interests in Serbia and plans to strengthen its presence in the region. JTI has so far invested 45 million USD into the Senta plant. In the next few years the overall figure, including production, sales network and marketing should reach 100 million USD. The goal is to place their products in the foreign markets, principally those of CEFTA and Western Balkan countries. Mr. N. Tasic, Mr. I. Kumakura, Executive Deputy President, H.E. Mr. Ivan Mrkic, Mr. M. Koizumi, Executive Vice-President, Mr. K. Shimayoshi, General Manager, Mr. N. Kato, Tobacco Business Planning Div. "International Kids Art Association" organized an exhibition "From a visit in Serbia to Komaki " in the Civic centre in Komaki city, Aichi prefecture (April 16-25). Some 90 drawings by Serbian and Japanese children were exhibited. On April 18, Ambassador Mrkić welcomed students of "Uramachi Junior High School" from Aomori Prefecture, who visited the Embassy during their study trip to Tokyo. In a friendly atmosphere, Japanese students had the opportunity to learn more about our country, its history and culture. 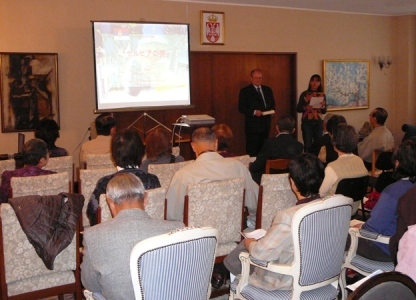 For the second year in a row, Nikko Travel Agency promoted its new tour package to Serbia in the premises of the Embassy. The program included Ambassador Mrkić's address to Japanese guests and a presentation of Serbian nature beauties in Japanese by the Third Secretary Ms. Kovač. Japanese guests also had the opportunity to enjoy Serbian wine. On April 15, a commemoration service was held in Tokyo in honour of Prof. Kazuo Tanaka, distinguished translator of Serbian literature and laureate of the Government of the Republic of Serbia, who recently passed away. 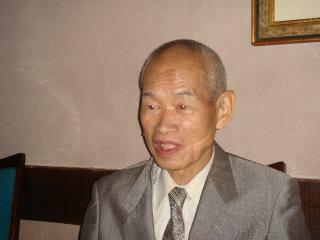 In the presence of the members of his family, around 200 guests expressed their respect for Prof. Tanaka and his work. Among those present were former Japanese ambassadors to our country, Honorary Consul General of Serbia to Japan and the representatives of Serbian Embassy. A condolence message of Foreign Minister Mr. Vuk Draskovic was read and presented to Prof. Tanaka's family. Also, many eminent admirers and friends sent their condolences. Ambassador Mrkić gave a speech honouring Prof. Tanaka and his important contribution in strengthening cultural ties between Serbia and Japan. 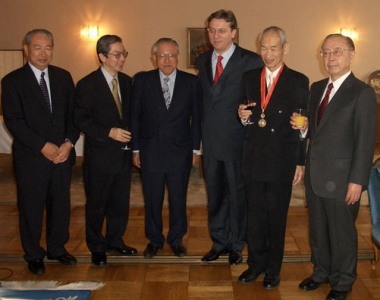 The guests were each presented with a copy of Prof. Tanaka's last book „Heart of the Balkans", published after his death. At the invitation of Radio NHK, Mrs. Snezana Janković, Counsellor, participated in the weekly discussion programme "Buffet 131" about foreign countries. During the half an hour programme in Japanese, Mrs. Janković talked about bilateral relations between Serbia and Japan, Serbia’s cultural heritage, its economic potentials and tourist attractions. At the invitation of the family of Mr. Naohide Ueyama, President of the famous Kincho Company and Honorary Consul General of Serbia to Japan, Ambassador of Serbia H. E. Mr. Ivan Mrkic and his family participated on April 7, 2007 in a traditional annual event in Kyoto, dedicated to the ruler of Japan from the 16th century, Toyotomi Hideyoshi. Ambassador Mrkic was the first ambassador ever to take part in the traditional procession, greeted by more than 48.000 Kyoto citizens, who warmly welcomed the Serbian ambassador. Ambassador of Serbia H.E. 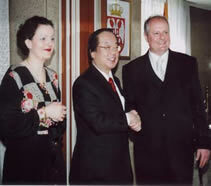 Mr. Ivan Mrkic was received by the Minister of Defense of Japan, H. E. Mr. Fumio Kyuma, on the 4th of April 2007. 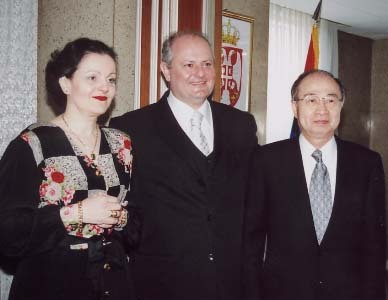 As Minister Kyuma noticed it, that was the first meeting ever between the first minister of Defense of Japan and the first Ambassador of the Republic of Serbia (after the former State Union of Serbia and Montenegro ceased to exist) to Japan. A wide range of issues of mutual interest was discussed, while further contacts and consultations between the ministries of defense of the two countries will follow. The exhibition of works from the collection of Iwano Atelier was held in the Fukui City Museum of Arts, Fukui Prefecture (April 3 - 10). 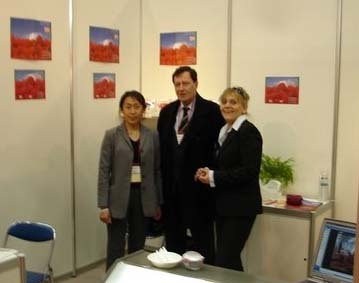 Exhibited were art works produced during years of cooperation between Mr. Heizaburo Iwano, one of the three best known specialists for hand made washi paper in Japan, and the Serbian artists. Every year, at the international art workshops organized by „The Iwano Project" in Serbia, artists create using Iwano's hand made paper. There were around 70 exhibited works, among which 36 of Serbian artists. At the opening ceremony were present the representatives of the cultural institutions of Fukui Prefecture. The Third Secretary of the Embassy Ms. Kovač gave a speech, read the message of the Ambassador, and gave interviews for the local TV station and newspapers. The representatives of Serbian National Radio and TV (RTS) visited Japan (March 21 – April 13) for making a series about the Orthodox church and religion in Japan. They made inteviews with Prof.Yoji Koyama of Niigata University, Prof. Nobuhiro Shiba from Tokyo University, Prof. Michitaka Suzuki from Okayama University and Ms. Yasuko Hamada from Meguro UNESCO Association. From March 16-18, Han Mime Kobo Theater of pantomime organized a graduation performance of their new members, "Itsuka Kita Michi". Milisav Bankovic, a student from Serbia, also gave a performance. Prof. Dr. Shigeru Saito of Shounan Hospital, visited the Embassy on March 16 before his fourth visit to the Clinic Center in Belgrade. Deeply respected for his donations to Serbian medical institutions and for skilled surgeries of patients with cardiovascular diseases, Dr. Saito was presented with a special acknowledgement for his contribution by Ambassador Mrkić. At the award presentation ceremony of "The 14th Annual World Children's Picture Contest" organized by Association "Ie no Hikari", Third Secretary Ms. Kovač received a copy of the gold prize winner's award. Among 46.000 childrens drawings from 70 countries in the world, Serbian children were awarded with 7 prizes (one gold, 5 silver and 1 memorable). Details of this year's event can be found on the following web page: http://www.ienohikari.net/zugacon/english/index.html . Serbian skaters at ISU World Figure Skating Championships 2007. Serbian skaters Mr. Trifun Zivanović and Ms. Ksenija Jastsenjski participated in the ISU World Figure Skating Championships held in Tokyo (March 20-30). More information is available on the official web page of the Championships. 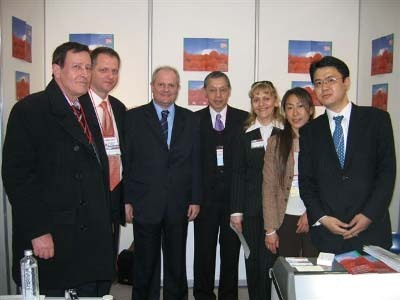 Eurasia tourist agency conducted a seminar on the Balkan region as a destination (Tokyo, March 21). Third Secretary Ms. Kovač was invited to make a presentation in Japanese on Serbia, its history, cultural heritage, national dishes and tourist attractions. From April this year, Eurasia will organize two tours which include Serbia (18 day tour and 13 day tour). 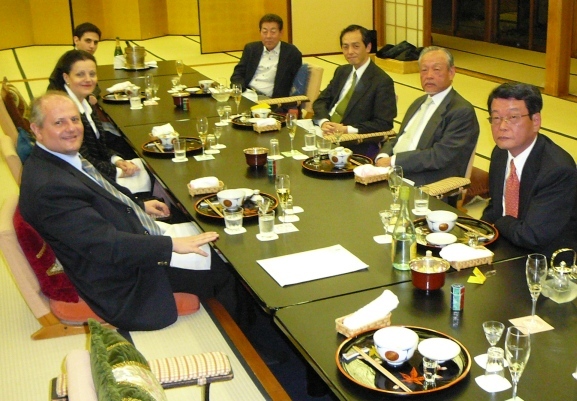 In the Embassy's premises, Japan-Serbia Exchange Association held its annual meeting and a reception for their members. The President of the Association, former ambassador Mr. Takehiro Togo, addressed the gathering, and the Chairman of the Board, Mr. Kenzo Yoneda, proposed a toast. For this occasion, Ambasador Mrkić held a speech and Serbian dishes and wine were served. 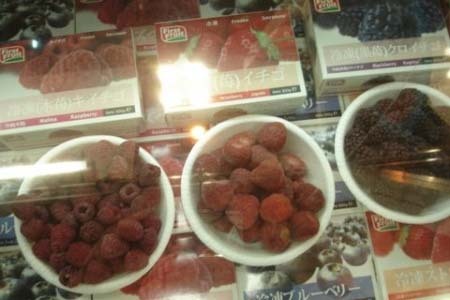 Three Serbian companies exhibited their high quality products at the International Food and Beverage Exhibition "Foodex 2007" at Makuhari Messe: Malina-Produkt (frozen wild fruits), Arex Marzipan (marzipan products) and Voda Voda (natural spring water). 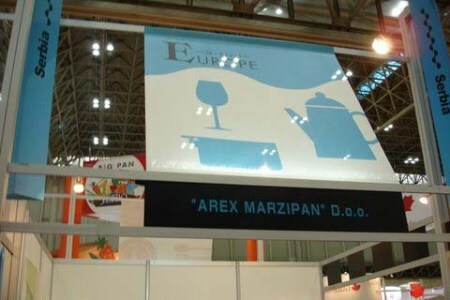 Serbia took part in this big international fair for the third time in a row. On March 9, renowned professor of Slavic languages and literature, translator and connoisseur of Serbian literature and cultural heritage, Prof. Kazuo Tanaka passed away after a long illness. 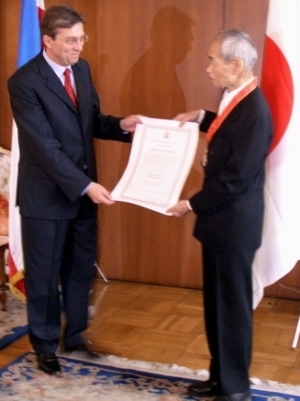 Prof. Tanaka was awarded a high decoration last year by the Serbian government for his merits in translating into Japanese the masterpieces of the Serbian literature. With his death, our country lost a close and important friend, whose deep knowledge, energy and enthusiasm will greatly be missed. Mr. V. Gavrilovic was a guest of the Institute for International Cooperation (IFIC-JICA). At the invitation from a group of NGO’s dealing with humanitarian aid in Serbia, Counsellor of the Embassy Mrs. Snezana Janković gave a two hour lecture in Japanese on the Serbian province of Kosovo. This event was arranged with the aim to enlighten the Japanese public about the historical roots and current status of the Kosovo issue and the need for humanitarian aid to the Serbian population in the province. Mrs. Janković also screened movie clips from the documentary "Days of Fear" and material from the Kosovo Coordination Center of the Serbian Government. During discussion period, Dr. Masayuki Iwata, distinguished professor at the International University of Tokyo and honorable member of Serbian Academy of Science and Arts, also addressed the guests. This event was a follow-up of the Economic Forum for the Western Balkans, held in Vienna on October 26, 2006. The Seminar was hosted by Vice Minister of Foreign Affairs Ms. Midori Matsushima. Serbia was represented by Mr. Bojan Jankovic, FDI Advisor in the Serbian Investment and Export Promotion Agency (SIEPA). 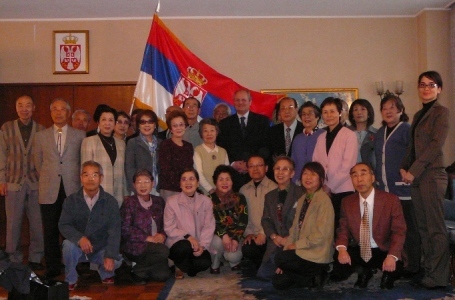 Japan - Serbia Association held its annual meeting and a reception for the members of the Association on February 23, 2007. The President of the Association, Prof. Dr. Shosaku Tokunaga, addressed the gathering. On this occasion, Counsellor Mrs. Snezana Jankovic congratulated the Association on its activities and achievements over the past fifty years of its existence. Well known Serbian tennis seeds Ms. Ana Ivanović and Ms. Jelena Janković participated in the Toray Pan Pacific Open Tennis Tournament in Tokyo. 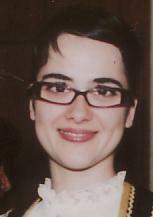 Ana Ivanović won second place. For the first time in the history of diplomatic relations between Japan and Serbia, established after World War II, Serbia celebrated its National day in Japan on February 15. Some four hundred distinguished guests from Japanese political, business and cultural circles, foreign diplomatic missions and Serbian expatriate community were present at the Embassy reception. The guests enjoyed Serbian music, national dishes, wines and spirits. At the seminar, held in the end of January, Serbia was represented by the State Secretary for Health Mrs. Nevenka Karanovic. Exhibition "Kako je bilo u Srbiji (How was it in Serbia?)" "Japan - Yugo Art Project" and Toki Art Space Gallery in Tokyo organized the exhibition „How was it in Serbia? ", which was a follow-up to last year's project that took place in Belgrade. The works of art were New Year greeting cards made by a group of Japanese artists which were previously exhibited at the Student Cultural Center Gallery in Belgrade, capital of Serbia. "How was it in Serbia?"